*Free admission to the main level galleries and activities in the public spaces. Special exhibits require a paid discounted ticket. One of San Francisco’s most celebrated after-hours museum events returns for a fall season of 2018. These nine Friday Nights feature free admission to the main-level galleries highlighted by a reinterpretation of contemporary art in their permanent collection and new acquisitions called Specters of Disruption. In addition, Friday Nights will offer reduced-price tickets of $14 to the exhibition Contemporary Muslim Fashions from 6–8:30 pm. Through social-media moments and in-person dialogue, visitors can engage and commune with the art and with one another in a warm and welcoming setting. Enjoy specialty drinks and mocktails, coffees, teas, and snacks. Bring your friends. Strike a pose at the selfie wall. Listen to music. Make art. Activities take place from 6–8:30 pm. FREE – Admission is free to the main-level galleries and performances in Piazzoni Murals Room and Wilsey Court. October 5 – Stephan Rabimov talks Fashion Diplomacy: The Unspoken Rule of International Relations. From the Olympic Games to the First Ladies’ wardrobes, Rabimov surveys fashion’s specific cultural messages and its impact on national identity and international perceptions. This lecture takes place in the Koret Auditorium, and tickets are first-come, first-served. October 12 – Muslim entrepreneur Lisa Vogl, co-founder of Verona, the first modest fashion line to be carried at Macy’s, will tell her story beginning at 7 pm, with a Q+A to follow. This appearance is free and open to the public, but space is limited. October 19 – Tonight’s musical guests, The Aswat Women’s Ensemble have been hailed by KQED’s The Do List as “one of the jewels of the Bay Area music landscape.” Hear from activist fashion journalist Hoda Katebi. Her book, Tehran Streetstyle is the first-ever in-print celebration and documentation of illegal fashion in Iran. October 26 – The de Young hosts the cool and hilarious podcast #GoodMuslimBadMuslim for a live recording discussing the good and the bad of the American Muslim female experience. Musical guest Keenan Webster brings the West African Kora string instrument to Wilsey Court. November 16 – Join for some hijab style tips, demonstrated by mother and daughter Fahima Altaf Khan and Saahar Khan, followed by a special appearance from our Teen Advisory Board. Also, welcoming Leah Vernon, the Detroit-based social media influencer, inclusive content creator, and plus-size hijabi model featured in places like Elle Magazine, Marie Claire, Seventeen, and Teen Vogue. Vernon will speak about her body-positive platform. 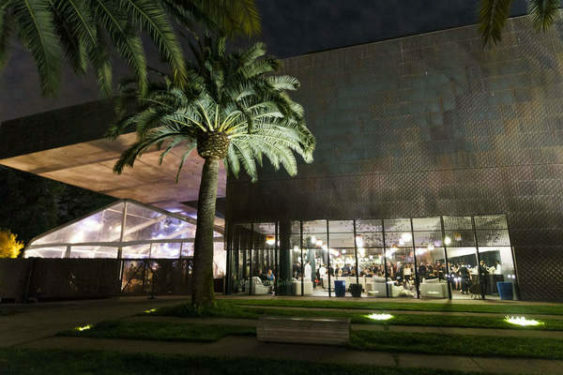 November 23 – Join in for the final Friday of our 2018 Friday Nights at the de Young series. Inspired by the art and fashion of Contemporary Muslim Fashions? Get your creativity on at our art-making station in Wilsey Court. A selection of food and drink will be available from the Museum Cafe, including halal choices and creative non-alcoholic “mocktails.” Enjoy a curated musical playlist by MIPSTERZ, a non-profit initiative stubbornly dedicated to carving out positive creative spaces for Muslim Americans and other marginalized groups. The Museum Store will have exclusive books and special designs by designers featured in the show. Another not-to-be-missed Friday Night experience is the James Turrell Skyspace (located in the Osher Sculpture Garden), which activates and begins to change color 20 minutes before sunset each night.